Alongside the runway shows at Nolcha Fashion Week: New York, accessory designers will be exhibiting their spring 2011 collections at 195 Broadway, New York, NY from September 13-16. Nolcha Fashion Week: New York, currently held during New York Fashion Week provides key exposure to press, buyers, and industry figures for independent fashion designers from all over the world to break into the New York fashion market, in both apparel and accessories. The Accessory Exhibition welcomes brands showcasing shoes, jewelry and bags from around the world. Some of the accessory designers include Adha Zelma by Sheanan Bond and Cherise TrahanMiller, bessi by Carlos Zuniga, Evolve45 by Sara Marston, M. Brûlée by Michelle Price, Ana Gutierrez : Wearable Art, Maleku Jewelry by Ileana Rojas-Bennett, Marla Cielo by Andrea Tobin and ELLY CLAY by Crystal Haylett and Stacey Giambastiani. Adha Zelma is an audacious and distinctly international, celebrity jewelry line created by long-time best friends Sheanan Bond and Cherise TrahanMiller. 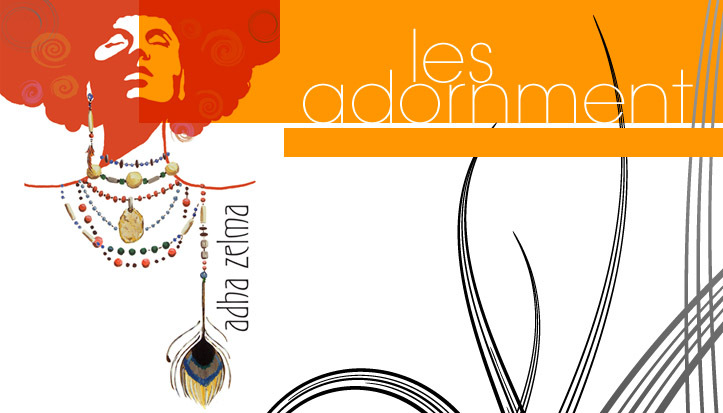 Adha Zelma specializes in working with precious metals, gemstones, Czech beads and exotic materials like tusks, python ribs and stingray to bring the fashion-forward woman statement accessories. Creations have been worn by Jennifer Lopez, Michelle Williams, Keri Hilson, Arlenis Sosa, Aisha Hinds, Ananda Lewis, Rosie Perez and celebrity make-up artist Scott Barnes. Adha Zelma also created the accessory line for “MTV’s Spring Break – Fashionably Loud” in Cancun, Mexico. bessi by Carlos Zuniga combine the design aesthetics of architectural values and diverse personalities. “Structure and character”, as he likes to call it, Carlos designs footwear for the bold and stylish individual. His collection emphasizes texture, minimalism, and bold heights. Designer Sara Marston of Evolve45, believes that making a more natural handbag not only accessible . . . but fashionable! Evolve45’s luxury handbags are crafted with natural fabrics that are just as fabulous as the women who sport them, and Evolve45 is constantly striving to find the highest quality eco-materials available. The bags feature Genuine Italian Vegetable-Tanned Leather™ Consortium vegetable-tanned leathers, environmentally responsible Ultraleather, and organic cotton linings. M. Brûlée by Michelle Price is art, luxury, exclusivity. Each piece is made of only the most luxurious and unique leathers found around the world with all hardware from recycled copper or brass. All items are entirely handmade and the greatest attention to detail is given to each individual creation. 10% of each purchase is graciously donated to nonprofit organizations dedicated to providing food, medicine, clothing and other necessities to hungry and underprivileged children and families across the world. Maleku Jewelry Designs by Ileana Rojas-Bennett is an expansive line of enchanting jewelry (including eye-catching semiprecious stones in a range of captivating colors) offers everything from dramatic and bold standout pieces, to delicate and intricately crafted stunners. Maleku Jewelry journeys into 2010 with “The Traveling Artisan”. The line will launch new pieces with detail, function, multi-use, fast fashion and embellishments in mind. The latest creations are made especially for the Boudoir Gypsy- the woman who takes her entire trousseau and wears it all layered together to go off jet-setting. The pieces hint at a past, an emotion, a hidden secret and yet bare the sophistication of the new socialite. Ana Gutierrez: Wearable Art uses materials directly mined in the country and lapidated by her, combined with more traditional ones she imports from all around the world. The use of unexpected materials like wood, feathers, leathers or rough stones sets her jewelry apart from others. A winner of the Tiffany and CO Diamond Accessories Award at Miami Fashion Week 2008 and the Lalique Diamond Accessories award for 2007 at the same event, Ana Gutierrez always strives to be unique. This 2009 collection is made with 100% recycled silver from state hospital x-ray machines. Design Team, Crystal Emmanuelle Haylett and Stacey Giambastiani of ELLY CLAY bring over a decade of experience in creating artists trends, celebrity styling, designing and development. The philosophy is to create a handbag that women can use on a daily basis as they run their busy lives, while being extremely stylish and comfortable. Inspired by urban chic, street style, architecture and culture of busy New York lifestyles, the designers are focused on detail, innovation in hardware and design. Elly Clay handbags are becoming a hit with Hollywood’s new generation of rich and famous. Annalynne Mccord, Stephanie Pratt, Karina Smirnoff, Taraji Henson, Haylie and Hillary Duff and more have all been seen wearing Elly Clay. Marla Cielo handbags, designed by Andrea Tobin,are hand-painted, and manufactured entirely in New York City. The production process incorporates socially responsible materials and manufacturing. Marla Cielo is committed to the belief that spending the necessary time and resources to manufacture one-of-a-kind goods in the U.S. brings true value to the consumer and to the fashion industry. For more information visit www.nolcha.com. Adha Zelma & Fashion's Night Out!!! !